Spinal decompression is used to treat back pain that is caused by problems such as a herniated disc or sciatica. Spinal stenosis makes the channels of the spinal column narrow, and pressure begins accumulating, causing the vertebrae to compress down on the discs in between. Such stress can lead to the damage that causes back problems such as bulged discs. Spinal decompression is used to reverse the effects and take stress off of the spine. Spinal decompression therapy is most beneficial because it treats the exact injured location, not just the symptoms. It goes right to the source of the problem. When the spine is compressed the flow of nutrients and blood is cut off leading to deterioration and breakage. Picture if you had tight elastic rolled up onto your upper arm and it was putting pressure down, cutting off circulation to the lower portion of your arm. If you leave it long enough you can see that the color will begin to change and it is very clear that your arm is struggling. It is the same thing with the back, only it isn't as visible and it takes a little more work than rolling off elastic. 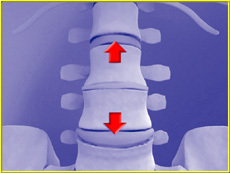 Spinal decompression can be achieved by using a therapeutic table that you are strapped into and a computer controls the table and it provides force and pressure to specific areas of the spine. The force being used against the stressed area will slowly cause it to decompress and the proper blood flow and nutrients can begin to be absorbed. There is also the option of surgery to remove any discs or widen the channels. Spinal decompression using the table often results in a permanent fix and for the most part, treatment is no longer needed again. The 24 vertebrae of your spine are separated from one another by pads of cartilage called discs. These discs have a fairly tough outer layer with a soft interior to cushion against the shocks and strains experienced as you move and put various stresses on your spine. The discs are subject to injury, disease, and degeneration with use over time. 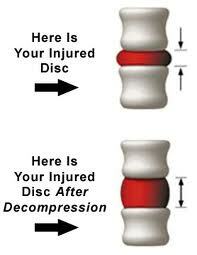 Certain activities and types of work increase the risk of discs being damaged or deteriorating. When the soft interior material of a disc pushes out through a tear or weakening in the outer covering, the disc is said to be herniated. Herniated discs are also called protruding, bulging, and ruptured, prolapsed, slipped, or degenerated discs. There are fine distinctions between these terms, but all really refer to a disc that is no longer in its normal condition and/or position. Herniated discs cause pain by impinging on (intruding upon, irritating, and pinching) and even injuring nerves in the spinal column. Most disc herniation takes place in the lower back (lumbar spine). The second most common site of herniation is the neck (cervical spine). A herniated lumbar disc may send pain shooting down through your buttock and thigh into the back of your leg (sciatica). Cervical disc herniation may cause pain in the shoulder, arm, and hand. Herniated discs can cause muscle weakness, make it hard to get up when you've been sitting or lying down, cause pain when you strain to do something, even when you cough or sneeze. They sometimes produce pain in the lower right side of the abdomen. Herniated discs may also affect nerves to the bladder and bowel, causing incontinence. This symptom signals the need for immediate, emergency attention.